Thank you so much for having us! Our time at the Villa du Square was amazing. You’re such a friendly host and the rooms are beautiful. We stayed here with the entire family for 2 nights to celebrate my wedding and it was the best we could have hoped for. You opened your house to us in a such a friendly manner and we enjoyed the breakfast and space you gave us. We are already talking about annual celebrations to come back, because we loved our stay this much. Also, the Photos on your website are as good as the reality! Christophe – thank you for making us feel as though we were staying with friends – which we were by the end of our stay. This is somewhere one always hopes to find but usually never does. A few minutes walk from the nearest metro. In a quiet residential district but in walking distance of the centre of Paris. The area is like staying in a French village with small, individual shops selling cheese, fish, fruit etc. Good restaurants are close by and Chris was very helpful with his recommendations and made reservations for us when necessary. The house shows the beautiful and elegant design ideas of Marie. Photos are everywhere, a grand piano to play, and there are vast amounts of literature and books about Paris. The garden is ‘English’ in style with many French flourishes. It leads down to a quiet lane along which, next door, is the Fondation Le Corbusier. Breakfast was splendid, with croissants, pain au chocolat, brioche, fresh fruit, superb yoghurts, freshly ground coffee – and so much more. The room was spacious with a very comfortable bed and great shower. The wifi worked well throughout the house. In all a very enjoyable stay – can’t wait to return. Henk and I had a beautiful stay at your property. We have talked about it fondly as our travels have continued. Your personal touch to us and attention to detail was very much appreciated. It is always a pleasure to be able to share time with hosts that make the home place as special as the experiences within the city itself. This is not so common and therefore means that I have you in my view for when I return to Paris to see more of the wonderful place. Take care and we will see you soon. We too, are sorry that we missed Christophe at our departure. He was absolutely correct about Versailles – magic indeed! We arrived home safely and already miss Paris! Thank you both very much for your generous hospitality. 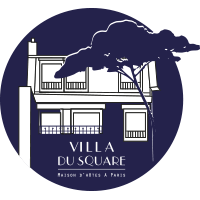 The room was very comfortable, the breakfasts and the coffee were consistently fresh and delicious, and we always felt very safe at the Villa Du Square and the surrounding area. Thanks you for helping to make our first trip to Paris a memorable delight! My husband and I had such a wonderful time staying with you, we can’t wait to come back to stay. Thank you for such wonderful hospitality and sharing your beautiful home with us. We hope to see you again soon!